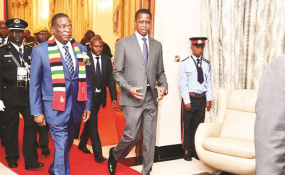 President Emmerson Mnangagwa being welcomed by his Zambian counterpart President Edgar Chagwa Lungu at State House in Lusaka, Zambia, on October 23, 2018. The second MoU was on the cooperation of management and preservation of Zimbabwe's liberation war grave sites. The MoU seeks to promote and appreciate the history and values, ideals and goals of Zimbabwe's liberation struggle and construction and reconstruction of site museums and monuments at the grave sites. Women's Affairs, Community, Small and Medium Enterprises Development Minister Sithembiso Nyoni and her Zambian counterpart Elizabeth Phiri, who is the Gender Minister, signed the fourth MoU on gender equity and equality and women empowerment through sharing experiences. In his brief remarks, Minister Malanji said: "The Joint Permanent Commission agreed on new areas of cooperation on industrialisation, investment promotion, works and supply and child development. The challenges faced at Chirundu one-stop border post, it was agreed to link and harmonise ICT systems procedures in the two countries in order to ensure full operation of the one-stop border post. Coming to progress, we have registered progress in the joint projects such as the Batoka Power Project and Kariba North and South Power projects. The Joint Permanent Commission called on the need to expedite the formalities on the twinning between Lusaka and the Mashonaland Central province as well as southern and Mashonaland West provinces in order to enhance the relations between the two sides." Said Minister Malanji: "The two sides reaffirmed to continue cooperation at regional and international fora, especially under the framework of the Troika of the Sadc Organ, Defence, Politics and Security Cooperation where Zambia is the chair and Zimbabwe is the incoming chair. We agreed to hold the 18th session of the Joint Permanent Commission in Zimbabwe."